Plenty of Terrence Howard’s standout film roles have showcased his love of music—he rapped in Hustle & Flow, played guitar in The Best Man, and acted alongside OutKast (Idlewild) and 50 Cent (Get Rich or Die Tryin’). That speaks to his deep musical background: His grandmother, Broadway great Minnie Gentry, taught him to play piano, and he grew up listening to albums by his great-granduncle, jazz legend Cab Calloway. On his debut album, Shine Through It, Howard, who sings, writes, and plays guitar, does right by his influences, assembling a batch of jazz, R&B, and neosoul tracks. His crack backup band, led by bassist and co-producer Miles Mosley, moves from flamenco guitar to big-band-era jazz, but the disc’s finest moments are the ballads. On “Love Makes You Beautiful,” Howard’s deep baritone nicely blends with the humming female backup vocals, and the title track is a soulful, uplifting romantic tune. 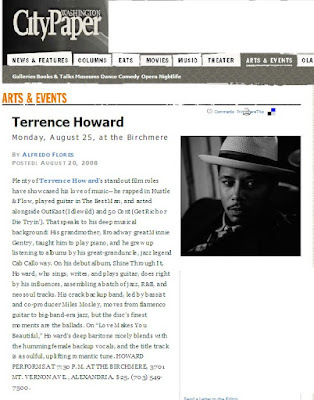 HOWARD PERFORMS AT 7:30 P.M. AT THE BIRCHMERE, 3701 MT. VERNON AVE., ALEXANDRIA. $25. (703) 549-7500.